Portably sized and well-spec'd EQ/DI that's ideal for the stage musician. Compact. Delivers a very clean signal. Lots of control options. Small switches are not ideal for onstage adjustment. 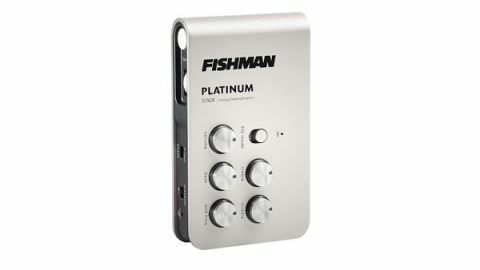 As good as Fishman's Platinum Pro EQ/DI is, at £289 it's a serious investment. At just less than half that price, this Platinum Stage Analog Preamp is a viable alternative, especially if you don't need the tuner or compressor of the larger unit. "It all works superbly, delivering a very clean signal to a PA and/or acoustic amp"
With its smaller footprint (143mm x 85mm x 30mm), it can be placed in your pocket or on your belt. The base of the unit has a belt-clip but also a rubber surround, so if you place it on flat surface, it's level. The front face sports a guitar/ bass mode switch and five low- profile rotary controls for volume, treble, bass, mid and mid-frequency. Around the edges there are phase, DI pre/ post and low cut (40Hz, 80Hz or 160Hz) switches, plus input trim, power adaptor in (it can be phantom or battery powered), in and out jacks, XLR DI out, and input clip/low battery indicator. Finally, on the left edge of the unit is a large push switch to engage boost, with a flush roller control to adjust its level from 3dB to 12dB. Its small size and numerous edge-placed switches mean you'll probably need to set it up prior to gig time. If you're going for on-body placement you'll be battery or phantom powered, and where you place it is crucial if you need to engage that level boost. Placement and setup aside, it all works superbly, delivering a very clean signal to a PA and/or acoustic amp. Not least with its phase switch and sweepable midrange, it could be life-saver, especially on those gigs that require fast setup and no soundcheck.